"Around Dodge City, and into territory on west, there’s just one way to handle the killers and the spoilers: that’s with a U.S. Marshal, and the smell of gunsmoke!" Radio's greatest adult Western told "the story of the violence that moved west with young America, and the story of a man who moved with it." That man was Matt Dillon, U.S. Marshal of Dodge City, Kansas, "the first man they look for, and the last man they want to meet." 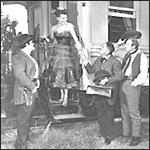 In Dodge City, Dillon was surrounded by hardened but heartfelt townsfolk, including his own deputy, Chester Wesley Proudfoot; the town physician (and mortician), Dr. Charles Adams; and the owner of the Long Branch Saloon, Miss Kitty Russell. During its decade long run on radio, this groundbreaking series was known for the realism of its sound effects, for the natural speaking style of its actors, and for the extraordinary talent of its scriptwriters.